The walls were built in medieval times, so as to enclose spaces and protect from any sieges the town Castellan of Boccheggiano. The work of military architecture was completed during the 13th century, when the Center was controlled by both the Bishops of Volterra. The defensive structure included a fortress, later transformed into the keep. This fortification was completely dismantled in the course of later ages. During the last centuries, the walls underwent further alterations, until it assumed its current appearance. 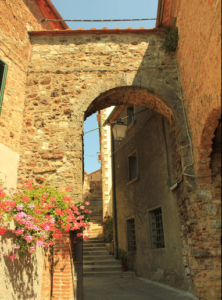 The walls of Boccheggiano, largely embedded in plastered walls of buildings in the old town, preserve some traits that have well describe the original stylistic elements of medieval times, with stone blocks. It is now devoid of fortifications and watchtowers as a result of the dismantling of the formwork, along the perimeter wall opens one door, however valuable, la Porta della Torricella, which gave the name to the road which crosses it.